Animal massage therapists use hands-on massage techniques to relax muscles, increase circulation, and improve the animal’s overall range of motion. Massage therapists must have detailed knowledge of animal anatomy and physiology, and some specialize in a specific species such as canine or equine massage therapy. Professional certification is available in the field. Practitioners usually charge patients by the visit, with fees normally ranging from $40 to $100 for each session. Equine veterinary technicians assist equine veterinarians with performing exams and surgeries, restraining horses for procedures, and taking x-rays. Equine vet techs can work in an equine hospital or work as a ride-along assistant when the vet goes on farm calls. Equine vet techs can work long and variable hours depending on the schedule of the vet they are assisting and the time of year (for example, a reproductive vet will have many evening calls to assist foaling mares during the spring). Equine vet techs can expect to earn a salary in the range of $25,000 to $35,000 per year. Veterinary surgical technicians assist veterinarians with a variety of surgical procedures, operate surgical equipment, and perform pre-operative and post-operative care (such as surgical site preparation and bandaging). These specialists may achieve professional certification by passing an exam after logging 6,000 hours (3 years) of vet tech experience (with 4,500 hours of that experience consisting specifically of surgical work). Veterinary technician specialists often earn a salary of over $40,000 per year. Emergency and critical care veterinary technicians assist veterinarians with emergency treatments and surgeries. Emergency and critical care vet techs must be able to respond quickly to treat animals in life-threatening situations. They may achieve specialty certification if they can document 3 years of experience in the field, provide detailed case logs and case reports, and pass a certification exam. Depending on the specialty, vet tech specialists can earn anywhere from $35,000 to over $50,000 in salary. Although, it's not uncommon for emergency vet tech specialists to make over $40,000 per year. Those who have significant experience or choose to work night and weekend shifts may earn even higher salaries. Zoo veterinary technicians assist veterinarians with procedures performed on a wide variety of exotic animal species routinely kept in zoo collections. Duties may include surgical site preparation, taking samples, running lab tests, and giving fluids or injections. Specialty certification is available to those who pass an exam after having completed 10,000 hours (5 years) of work, a skills checklist, and detailed case log. The salary for zoo vet techs is $30,000 to $45,000 according to Indeed.com. Pet insurance agents market health insurance policies to pet owners. Insurance agents advise owners on the variety of coverage options available (including mortality, surgery, and preventative care coverage). Most insurance positions are inside sales jobs, with sales primarily completed over the phone or via the web. Agents must be licensed in their state of residence to sell property and casualty insurance before they can sell pet insurance plans. Compensation may include a base salary, commission, and bonus. The median salary for pet insurance agents is $46,770. Some agents can earn well over $60,000 per year according to Glassdoor.com. Veterinary pharmaceutical sales representatives market medications and other animal health products to veterinary clinics. Both inside sales (office based) and outside sales (traveling) positions are possible. Competition is keen for these high paying positions, which often have additional benefits such as performance bonuses, commissions, paid travel expenses, and use of a company car. Total compensation can range from $40,000 to $70,000 per year. Wildlife rehabilitators provide treatment for injured wildlife and care for orphaned or abandoned young animals until they can be released back into the wild. Rehabilitators must be licensed by the state or federal government and obtain all necessary permits before beginning their career. Professional certification is also available. While many positions are part-time or volunteer-based, paying positions usually range from $25,000 to $35,000 per year. Animal nutritionists monitor the nutritional intake of the animals under their care to ensure that they receive a balanced diet. Nutritionists may be involved in education, research, or consulting. Salary usually ranges from $40,000 to $75,000 per year for animal nutritionists. Animal behaviorists study how animals interact with each other and the environment. Behaviorists may choose to work in academia, conduct scientific research, or interact directly with animals for their training for behavioral modification purposes. Salary may vary widely based on the specialty the behaviorist works in, but a salary between $40,000 and $80,000 is possible. 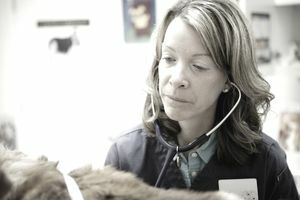 What Are the 7 Top-Paying Animal Health Careers? What Is an Aquatic Veterinarian?